I just got home from Women on Wheels at Gregg’s Cycle in Green Lake. It was terrific! Huge turn out, many raffle tickets bought to support the represented non-profits, and a panel of five local female executive directors of bicycle organizations (Cathy Tuttle of Seattle Neighborhood Greenways, Deb Salls of Bike Works, Elizabeth Kiker of Cascade Bicycle Club, Holly Houser of Puget Sound Bike Share, and Barb Chamberlain of Washington Bikes). I particularly like seeing a mixture of serious cyclists and transportation bicyclists. I even met a couple serious cyclists who have cargo bikes for carrying their kids on the side! I was a little intimidated, I have to admit. Yes, I own a serious road bike and a mountain bike, but only because Mr. Family Ride got them for me early on, hoping I’d take to cycling. And I did…but only once he added a beach cruiser to my fleet. But once or twice a month I get to go out all alone. My last time out with the road bike was this past Saturday for a hair cut. I wasn’t in a hurry heading home, but it was drizzly and I was really cold, shivering at each red light. 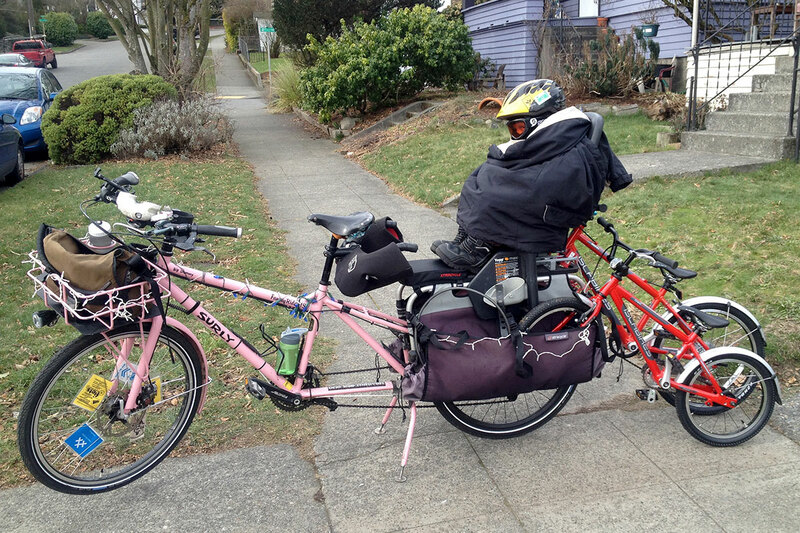 On a few solo occasions I’ve taken the 75-pound Big Dummy rather than the 20-pound road bike for the sake of staying warm, and probably would have this time, too, had I not been running late on the way down. I caught up to lycra-clad man on the flat part of Dexter and would normally have hung back to not engage in the whole woman-passing-man rigamarole. Interestingly, I didn’t even realize there exists a woman-passing-man rigamarole until this moment. Sadly, it’s second nature. Very often, if I’m pedaling along faster than a guy, I’ll pass him only to be overtaken a moment later. Yet then he’ll slow down to his previous speed. I don’t think it’s ever intentional, but it is a bit annoying. So I usually just slow down if I catch up to a guy dressed in a lycra. This, too, I didn’t realize until the moment I caught the guy on Saturday. But it was much too cold to slow down. So I kicked it up to late-for-preschool-pickup pace rather than just-quick-enough-to-warm-up and all was good (though my legs were a bit sore the next day). In terms of women on wheels in the general sense, Women on Wheels isn’t the only thing going on. The National Women’s Bicycling Forum is next Monday at the National Bike Summit. I won’t be there, but many friends will and I can’t wait to hear all about it. And meanwhile, I’ll do my part to get more women out there on wheels so the novelty of being passed by and/or passing women wears off. This Sunday, join me for Critical Lass rides to Bike Expo where we’ll check out the Cycling Wisdom by Women, for Women panel. And Saturday, it’s Kidical Mass to Bike Expo. Three days before our super snowy day, Hum of the City was in town from San Francisco. 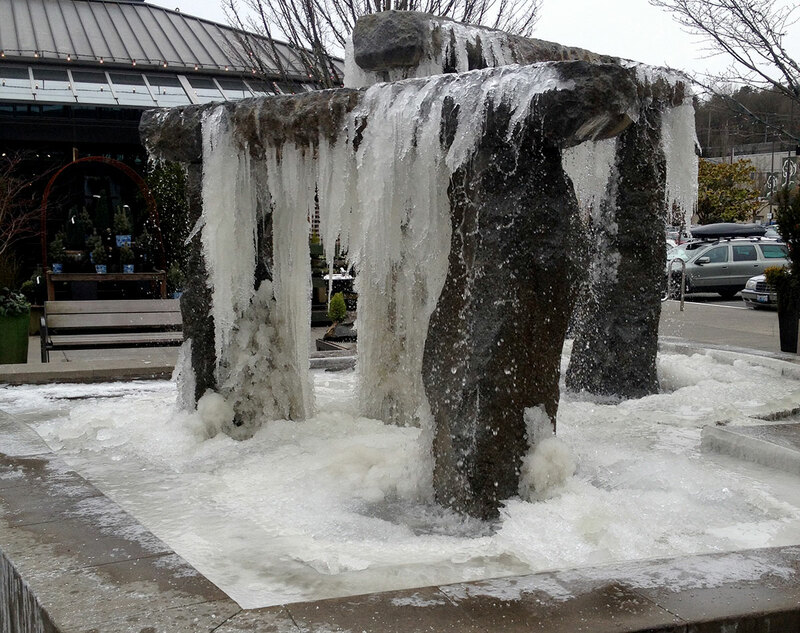 She blogged about the visit–Return to Seattle: Snow day!–but didn’t include any pictures of our fair city so I’ve taken it upon myself to provide a supplemental post. Counterbalance replaced the rental fleet with Civia Twin City bikes, but I was still able to provide Hum of the City with a step-through frame and these new bikes have more gears (though Breezer Uptowns come in an eight-gear variety, too). The handlebars seemed very wide and I, uh, may have caught them on the chain link fence of the Burke-Gilman Trail detour. I wish I’d thought to take the bike for a little spin myself, but I just dragged it around. As is my way, I hadn’t thought through carrying three bikes plus one kid without the Xtracycle WideLoader…though naturally I was excited about the challenge. Fortunately (or maybe unfortunately for my cargo cred), my son wanted to ride his own bike so we set out separately. 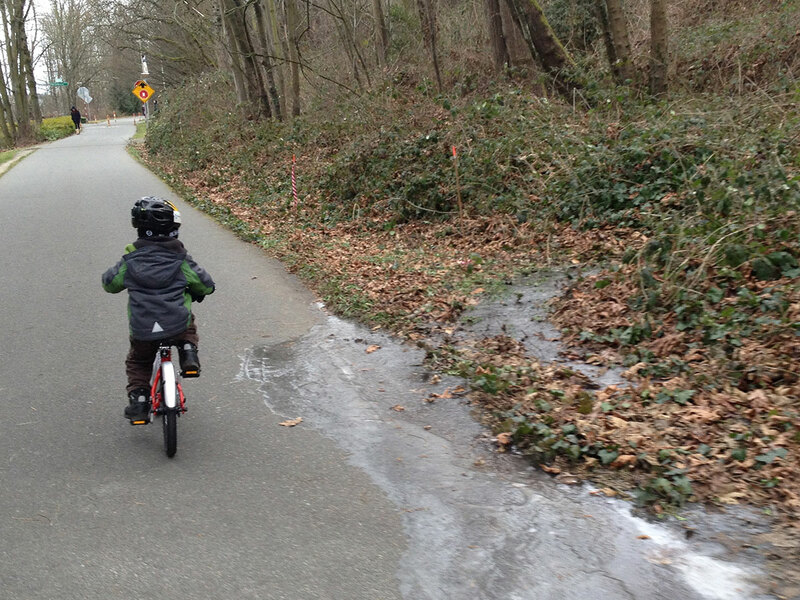 We encountered one icy patch on the Burke-Gilman Trail, but it’s been dry enough that slippery streets weren’t a worry. Carrying the bike downtown was fun. At an intersection in South Lake Union, a woman crossing the street said she’d seen me from the bus on Eastlake and what on earth was I up to? 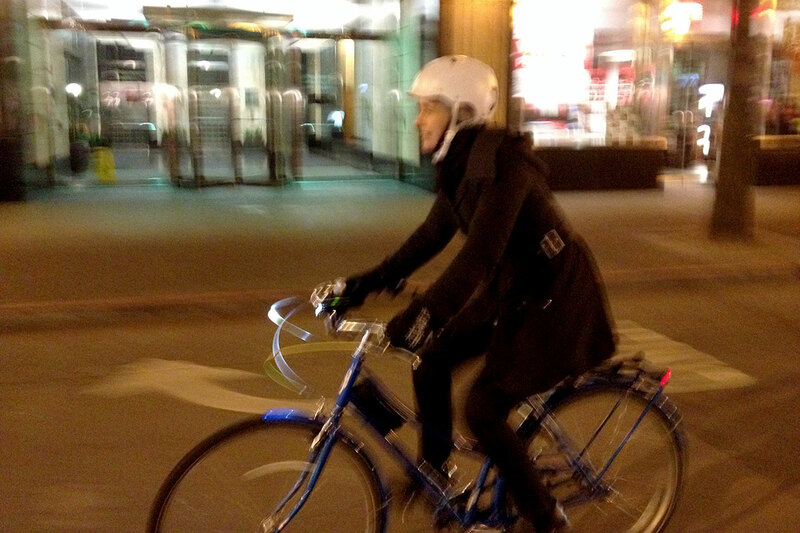 We happy houred at the hotel for a bit so by the time we got to the #BikeLove Party it seemed to be winding down. Apparently the food disappeared in a flash; biking and love make people hungry. But I got to introduce Hum of the City to a bunch of people she’s only seen in pixel form before. And on the way back, we got SNOWED ON! I took the Civia back home with me, though had the weather been warmer, it would have stayed at the hotel overnight to be used for a three-mile waterfront pedal to our lunch date the following day. 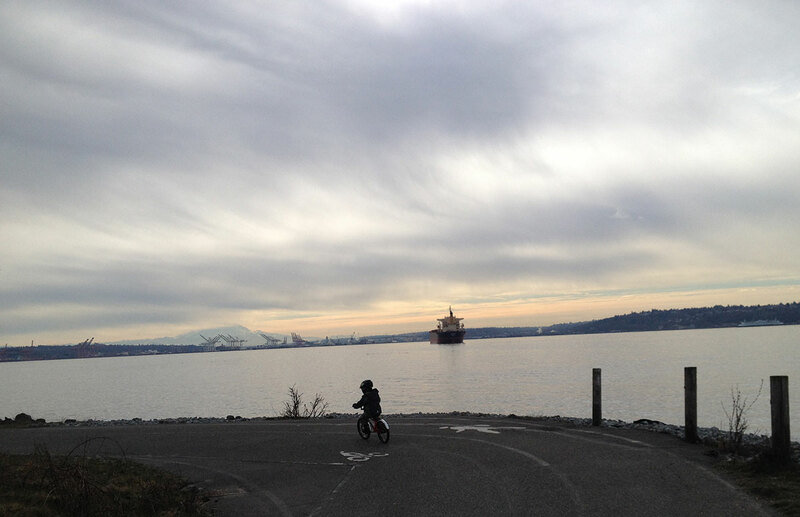 I’ll have to bring Hum of the City to the Elliott Bay Trail on her next visit because she missed a most beautiful ride. In heading to Fuji Bakery to meet Hum of the City and Jen of Loop-Frame Love and Ballard Greenways, we took the Amgen Helix Pedestrian Bridge. I’d only been over once before with the small mamabike and that was a tight fit in the elevator, but I was able to get the Big Dummy in–the trick was wheeling into the elevator backwards. And heading back over we fit three adults, one four-year old, kid bike, and Big Dummy. It’s no secret that I’m not the most bike-fixey of family bikers. On the one hand, I like to demonstrate that one can know next to nothing about bike maintenance yet still successfully bike all over the city with kids. But it’d certainly behoove me to be a bit self-sufficient. I used to be an accomplished flat-tire changer, back at bike-friendly UCSB. I kept two spoons, borrowed from the dining commons, in my backpack to use as tire levers and quickly changed many a flat. But I haven’t changed one since then. Nowadays I walk my flat bike to the closest bike shop. Or allow a friend to do my dirty work–thanks, Tom! Part of my problem is that I’m loathe to attempt any full-attention-requiring feats with my two little “helpers” in attendance. But I’m also intimidated by my bike–disc brakes and dynamo hub in the front, disc brakes and wheel-hiding bags in the back are new since college. Not to mention the 76.4 pounds (not counting any rocks in my FreeLoader bags) of bike to manipulate. But after nearly six years of family biking it’s time to change! I’ve been talking about taking Bike Works’ Bike Repair 101 (formerly ABC: Adult Basics Class) for at least a year, but haven’t been able to find time to commit to a six-week class. Fortunately I went poking around online and found this page about repair class at nearby R+E Cycles. I called to check the date of the next class and learned they’re taught on demand. I think other shops probably do this, too. For instance, I found a very old class calendar on Recycled Cycles’ website, but have since seen repair classes advertised on their sidewalk placard. In this 2 – 3 hour class you will learn how to fix the things that stop your ride. Frosene of Bikelava–Artisan Peddled Baklava had the smallest bike–a lovely new-to-her Rodriguez–so John put it up in the stand for the duration of the class and we all worked on it in addition to our own bikes. Check out the built-in bottle opener! I think all Rodriguez bikes have this. We laughed, we learned, my bike was the guinea pig for fixing a broken chain when John noted my dirty chain was not just disgustingly dirty, but also stretched out and due for replacing. From now on I vow to clean it weekly and lengthen its life. And I’m no longer scared of my tires…though thank goodness my Schwalbe Marathon Plus tires are incredibly flat resistant because it was soooo hard to get the steel bead in and out of the rim. Free Bicycle Repair class Thursday Feb 20th @ 7:00pm! Come down to Peddler Brewing Company on Leary Way just past 15th in Ballard to get greasy with me. I will be going over basic mechanical and maintenance procedures such as : Fixing a Flat, minor adjustments of brakes and derailleurs, how to repair a broken chain, proper cleaning and lubing, etc… If anybody has any specific questions concerning their bike, feel free chew my ear a bit (figuratively, you sickos) and we’ll get it all straightened out. I hope to see y’all there. 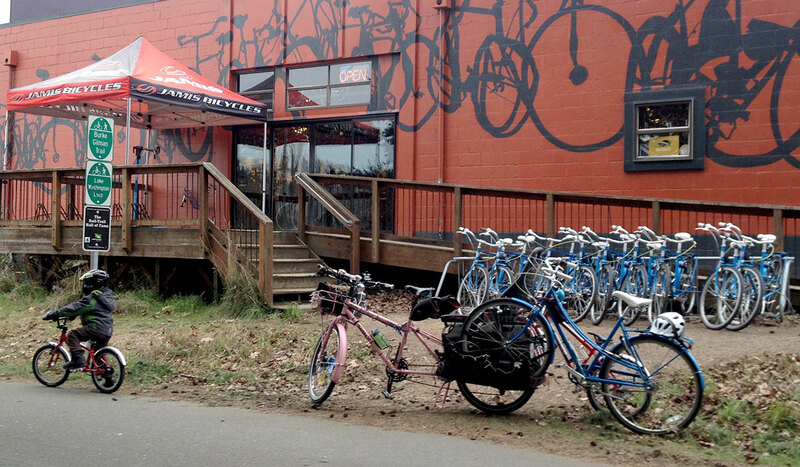 And visit R+E this Saturday between 10:00 a.m. and 5:00 p.m. for their annual Bike and Pike Open House. Want some online bike fixing inspiration? Watch Cascade Bicycle Club’s video: Fix-a-Flat with Robin Randels, one of my Seattle Critical Lass co-founders. Sadly, I had to cancel Explore the new Beacon Hill Greenway with Kidical Mass last Sunday on account of snow. We weren’t up for the long trek to Beacon Hill in those conditions, but made the most of the snow close to home. However, I checked it out (a.k.a. route tested) the Wednesday before the scheduled ride…otherwise known as Seahawks Parade Day. I had called for the ride to start from the playground at Judkins Park, assuming the restrooms of such a large park would be open year round and justify starting the ride 0.6 miles away from the start of the greenway…but they were on seasonal closure. Something to keep in mind if we get a chance for a do-over before public park potty season starts. However, starting north of the freeway meant I got to ride over this six-block-long ped-and-bike bridge alongside the freeway that meant avoiding a dip and climb. Google maps tells me this is part of the Mountains to Sound Greenway Trail–a different type of greenway, not to be confused with Neighborhood Greenway. And that took me straight to the Greenway. Looking back towards the trail used to access the greenway shows the DEAD END sign Transportation Nag writes about (among others) in Not Dead! It’s a Living End! Due to the closed restrooms, I made plans to stop in at Hello Bicycle for kids in need of a pit stop and for a quick toe thawing. Playground-to-playground rides are tough in the cold season, though I had planned to bring lots of blankets and extra outer layers along to share at the end point. My original plan was to ride to the south tip of the greenway and return to Jefferson Park, but it was a slight downhill the whole way after the park and I didn’t think it was worth climbing back up if there were little riders along. So here’s the route, though I think a future ride might start much closer, like at the Beacon Hill Library, because the beginning of the greenway has a hill, too. I think the Beacon Hill Greenway isn’t completely done, but when it is, Beacon B.I.K.E.S. will organize a celebration. I found some of the transitions a little confusing so I hope those will change. Following a turn of the greenway through a two-way stop often meant stopping to wait for free-flowing cross traffic which felt a bit awkward–these would be more comfortable as four-way stops. There were quite a few of those. And it was interesting to see a combination of speed humps–one across the whole street or divided into two or three humps. The three-piece speed humps didn’t encourage the few motorists I encountered to slow at all. And there’s a Little Free Libaray at 3307 Lafayette that would make a fun stop. It didn’t contain any children’s books when I route tested, but I could hopefully recruit a nearby Kidical Masser to seed it with something for the kiddos ahead of time. Saturday, March 1: 9:00 a.m. – 6:00 p.m.
Sunday, March 2: 10:00 a.m. – 4:00 p.m. 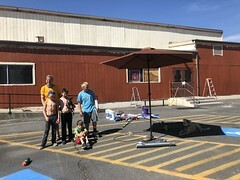 Even the not-specifically-for-kids things are fun, like running the wrong way up the green bike lane carpet shouting, “I’m a salmon!” and pedaling a stationary bike at Watts-Up? Non-pedalers should check out the Learn to Ride Class Saturday 9:30-10:45 a.m. (Bike Stunt Area on level one) and all kids should hit the Wheelie Fun Stunt Course Saturday and Sunday 11:00 a.m.-1:00 p.m. Bike and helmets will be provided! Last year a bonus stunt course was added outside, but no guarantees that will happen again so try to hit one of the early ones. We also enjoyed last year’s indoor picnic area provided by Nutcase Helmets. Kids ran and rolled on the artificial grass and colored with sidewalk chalk while parents perused the adjacent Kenmore Camera Photo Contest entries (you can still enter photos through February 25th!). This year it’s called “Lounge & Spinathon Area” so it might look quite different. Last year the family bikes were at booth 306 (back left corner on level one–here’s the floor plan). I’ll be there most of the time as well and we’d love local family biker volunteers to hang out with us at the booth–sign up here. Bring your bike, bring your kids! Conveniently close to the potties and the food court. I’ll lead a Critical Lass ride to the event on Saturday and a Kidical Mass ride over on Sunday. Details on those coming soon. Bring a friend and save some cash: Cascade has a livingsocial deal going for two one-day tickets for $9.